This is another re-discovered dish. Our Yaya used to do one pork with tausi dish when we were growing up, but it has been more than 15 years since I've had her, or any other, version. I had bought a pork loin and decided that it would be used for the very purpose of reconnecting us with the past. This dish could be made with either (a) dried fermented black beans, rinsing them first and soaking them in some hot water, (b) canned black beans, what we call "tausi", rinsed first and then used as is, or (c) a prepared black bean and garlic sauce. I generally go the (c) route, buying the Lee Kum Kee brand. I cut the pork loin into strips, the thinner the better, of course, but when pressed for time, these thick-ish strips will also do. These are marinated for 30 minutes with one tablespoon of Shaoxing wine and velveted with cornstarch, as much as needed to coat the meat strips. These strips are quickly stir-fried-seared in a very hot wok. Batch-cookery applies, although I must say I've gotten away with just dumping the whole lot into the wok. After the pork strips are cooked and taken out, I put some chunks of tomatoes, garlic into the same wok until they're cooked through and fragrant. I then add a couple of tablespoons of black bean sauce to the tomatoes. 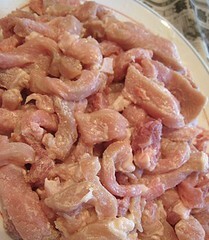 The pork strips are then put back into the sauce to cook completely. This brings back memories and very delicious memories at that. This is wonderful with white rice and it is such a bonus that the whole dish comes together very quickly, less than 30 minutes. 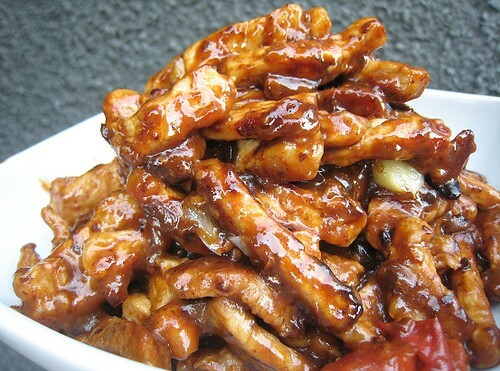 Marinate the pork slices/strips: Add a few spoonfuls of Shaoxing wine to the pork, just enough to moisten the pork. Mix in some cornstarch until it forms a paste with the wine. Adjust Shaoxing and cornstarch proportions to your liking. Set aside marinating pork, about 30 minutes. 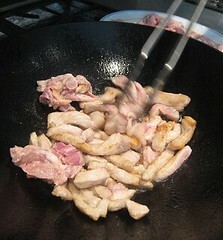 In a hot wok with hot oil, add the marinated pork pieces, tossing until they are 90% cooked. You may need to do this in batches if the wok is not large enough. Take out pork pieces and set aside. In the same wok, heat oil. 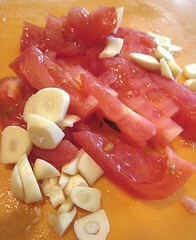 Add tomatoes and garlic and cook until fragrant, 30 seconds to 1 minute. Add a tablespoon or so of the black bean sauce. Put back pork strips into the wok. Toss around until the pork is cooked through. Adjust seasoning (you may add more black bean sauce if you wish). 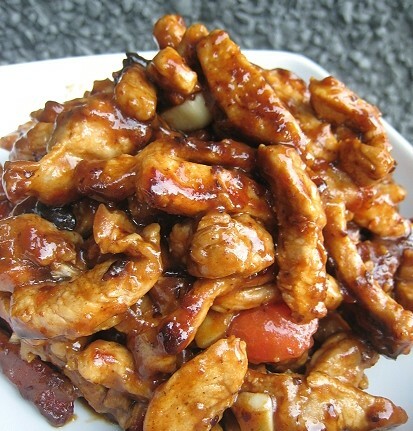 I love black bean sauce & that sounds like a fantastic way to make pork. Excited to meet you guys at the Foodbuzz Festival! I made black bean sauce pork ribs before! SO yummy! Black bean sauce is great for quick, simple and tasty meals! Great looking pork dish! I love tausi too, especially in a good pork humba. Very simple dish, but full of flavor. Would you believe, they don't sell black bean sauce here in Kuching? Gotta fly all the way to KL to get it. Oh really?! 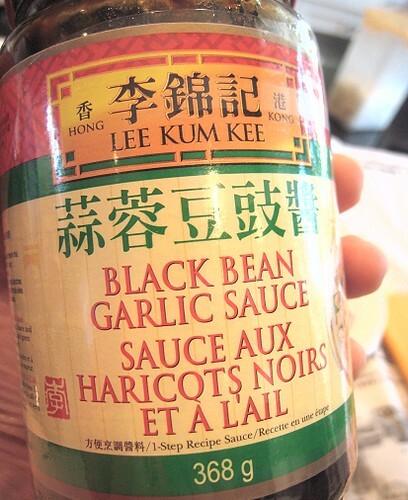 I would've thought black bean sauce would be more accessible in Asia! BF asked if we can have it again tonight. Maybe with some garlic rice for a treat (he loves sinangag). Woohoo! Another easy dinner night! Definitely putting this on rotation. Thank you so much for another recipe!!! excellent, although I forgot stir-fry means HIGH heat when I made it.still came out edible..